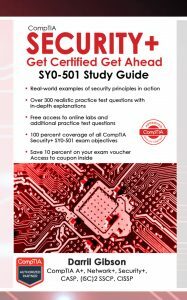 This page is dedicated to sharing errors identified in the CompTIA Security+: Get Certified Get Ahead: SY0-301 Study Guide. If you know of any errors in the book, please let me know. While not an error, you should know that CompTIA has added performance based type questions to the exam. The objectives are the same, but the format of the questions are different. This page has links to multiple blogs including blogs on the new performance based questions. Kindle Loc 649 CompTIA switched to Pearson Vue exclusively on July 9, 2012 for testing. You can no longer take tests at Prometric testing centers. This article gives more information. Kindle Loc 1486 On question 12, the last answer is listed as A but should be D.
Kindle Loc 1923 On question 95, the answers aren’t labeled but should be labeled as A. B. C. and D.
Kindle Loc 2673 In the Strong Passwords section, a typo has “(966)” instead of “(946)”. The first sentence of the first new paragraph on page 65 should read as:However, if you use all ninety-four printable characters with the same six and ten character password lengths, the values change significantly: 94^6 (946) is about 689 billion possibilities, and 94^10 (9410) is about fifty-three quintillion. Page 123 On question 4, change answer A to Backups.4. Which of the following is a preventative control? periodic review of user rights is a specific type of detective control.Note: While it’s true to say that the principle of least privilege is a technical control, this refers to the type of control (technical, management, and operational). However, it’s function is also as a preventative control. Common functional controls are preventative, detective, and corrective. All other answer descriptions focused on the function but the answer description for least privilege focused on the type.With the original question, it is accurate to say that both least privilege and security guards are preventive controls. However, the question implied only one answer was correct. Kindle Loc 4837 In Table 3.1, an extra bit is added for “100” in the fourth column “With leading zeros.”It should be 0110 0100. Kindle Loc 5586 In the answer to question 10, it gives the correct answer “Simple Mail Transfer Protocol (SMTP) uses port 25.” However, it mentions that SCP, TFTP and SSH all use port 22. It should read as: SCP, SFTP, and SSH, all use port 22. Kindle Loc 6003 In the second paragraph under Table 4.1, the frequencies are incorrectly listed as 2.5 GHz and 5 GHz.They should be listed as 2.4 GHz and 5 GHz as listed in Table 4.1 and elsewhere in the book. Kindle Loc 6324 The definition and explanation of bluejacking is inaccurate. Bluejacking is the practice of sending unsolicited messages to other Bluetooth devices close by, but it cannot send messages from the remote Bluetooth device. Bluebugging attacks do allow the attacker to take full control of remote phone and can send messages from this phone. to others. Ensuring your Bluetooth devices are not left in discovery mode is the best defense. Page 303 Kindle Loc 8931 The IP addresses have an extra 168 in them. They are listed twice as 192.168.168.1.1 but should be 192.168.1.1. Kindle Loc N/A Page numbers 363 to 368 are missing but no content is missing. Chapter 8 ends on page 362 and chapter 9 starts on page 369. All the content is in the book, and the index accurately refers to correct pages in the book. Kindle Loc 11804 The sentence reading as “The hashes shown in Figures 9.1 and 9.2…” should read as “The hashes shown in Figures 10.1 and 10.2…”. These figures on are the previous page. Page 453 The explanation for question 8 has a typo. Specifically, data encrypted with the private key can only be decrypted with the matching public key. The following explanation shows the correct explanation. 8. A. Data encrypted with a public key can only be decrypted with the matching private key, and data encrypted with the private key can only be decrypted with the matching public key. The same asymmetric key used to encrypt data cannot decrypt the same data. Depending on the usage, either the public key or the private key can encrypt or decrypt.